Easy DIY Mothers Day Gift. Easy DIY Mothers Day gift any one can put together, even at the last minute! Show your Mum how much you love her, by giving her a lovely gift of a Mothers Day succulent mug. Its a great inexpensive little gift, that can make a big impact, because its handmade by you! And the great thing is, it's so quick and easy! There are lots of really great mugs with quotes for Mum's out there, that are just right for this do it yourself. like the sweet ones I have used here. Choose one that suits your Mothers taste or personality, then plant it up with easy care succulents. Bam! a gift made just for her. You could even find Mothers mugs at the charity shop, as its being used as a planter. Step 1. Place a layer of gravel or pebbles in the base of the mug. To fill about a 1/3 of mugs volume. This will act as the drainage, so the roots don't sit in wet soil. Step 2. If you like you can place a thin layer of charcoal on top of the pebbles. This is used to keep things from becoming smelly or growing mold. But I have seen many non draining vessels used, that have not had charcoal and they have grown very well and did not smell. Though it is a good idea to pour off any excess water within a few hours of watering. Step 3. Place some of the succulent soil in the mug. How much is a bit of guess work, as it depends on how much room your plants will take up. Step 4. Plant your succulents in the mug. Try to work out the placement of your plant or plants, before you plant them. Depending on the size succulents, you may have to take them back out and remove or add some soil mix. If your plants are a bit large in the root area, its best to gently loosen some of the soil from the roots or even trim the roots a little if necessary, to make them fit in the mug.Don't worry to much about being rough, succulents are fairly tough plants! Once you have the succulents arranged the way you like, add more soil to cover any exposed roots. Tap the mug gently on a firm surface just to settle everything. Step 4. Cover any exposed soil with your chosen pebbles or sand. This just helps to stop the soil washing out when watered, and to firm up the planting. It can also give the succulent mug a neater finish. Water about once a fortnight. Remember to pour off any excess water within a few hours. Succulents are best kept in indirect bright sunshine. 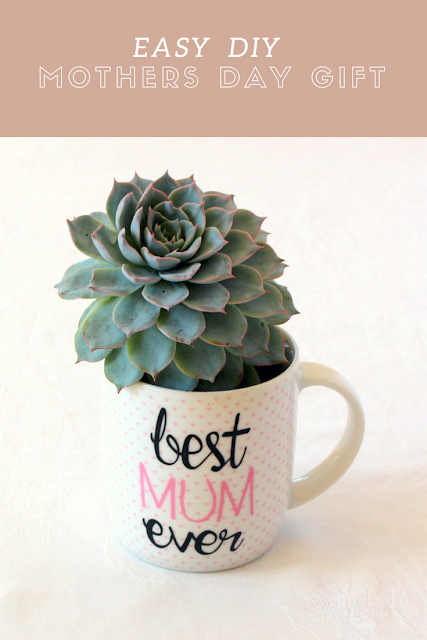 These terrarium Mugs also make great decorations for Mothers Day Celebrations. Which is exactly what I made these ones for. They can make a really cute centre piece, decoration for the food table, entrance or hall table. You can even spread them around in little nooks and crannies, to spread the message, that its Mums special day! Make a few, give them to your Mum, Mother In law, Daughters with children or decorate your home or Mothers Day picnic with them, on your own special day. The three Mothers Day succulent mugs I have put together here, actually have some very special significance for me. They are all mugs that my children have given me on past Mothers Days! Though they were looking a little shabby from many years of use, I didn't want to part with them. So being the plant lover that I am, I thought what better way to use my beloved Mugs than to team them with plants. And so the Mothers Day terrarium Mug decoration/gift was made! Hope you enjoy making this easy do it yourself Mothers Day gift! hottest trends In home decor. Ive really been enjoying the resurgence in popularity indoor plants have had in the past few years. I think the renewed fashion has been helped along a great deal by environmental awareness, and the popularity of mid century and 70s trends in decor. As both of those eras were very big on interior decor that included indoor or house plants. Growing up with plant loving parents, the garden as well as the family home, was always filled with wonderful plants and flowers. I suppose it was from this lovely influence, that in my own home, having not only an outdoor garden but an interior one, has always been an essential part of who I am. As well as enjoying the look of plants, I absolutely love the feeling plants bring to a space, don't you? Including plants in your interior decor can benefit your home lifestyle in many ways. Plants can bring a wonderful feeling of life to any area. Though most importantly they help to clean the air in our homes.They do this by absorbing harmful chemical gases such as benzene and formaldehyde, these harmful gases can be present in our homes from everyday things, like plastics, furnishings and household cleaners. I mean who doesn't want to breath less chemicals or enjoy cleaner air in their home? Plants cleaning the air? Is this scientific fact? Well for a long time there was a great deal of agreement on this point, but just recently it seems to have become a contentious issue with a few people, Then again so is climate change! What I personally can tell you, most plant lovers, my self included, know from their own experience that plants make the air in their home environment feel fresher. Which is one of the reasons they love having plants in their home! well being, and turned it into one distilled guide that explains in simple science the benefits we can gain from having plants in our living spaces. They have also included lots of information on the number, size and type of plants most beneficial, as well as styling ideas and a great virtual reality app that helps you style your home with plants. A site definitely worth your time, facts, fun and fashion in one place. Plants improve the perception of the space they are in.Indoor plants can affect our physical, emotional and mental well being. Many companies are introducing plants or increasing the number of plants in their offices or buildings, as are many schools and hospitals. Not only because they make a space feel good to us, but because they make us feel good. Many studies have shown that indoor plants reduce stress and fatigue, increase positive mood, memory, concentration, production and creativity! If that is not a good reason to accommodate some lovely greenery in your living spaces, I don't know what is. I like to think of the plants and planters in my home as changeable accessories, just like my cushions! My indoor plants are a constantly evolving display, I find rearranging them a really fun and creative activity. Having a variety of plants can make your display more interesting with varied height, texture, colour, plant and leaf shape. Big, little, hanging, prostrate, prickly, smooth, perfumed or flowering. There are so many choices, you are sure to find plants that appeal to you. And don't worry about having too many the more plants are together, the more they like it. And they will create their own micro climates that help them to stay healthy. There are many easy care plants that are especially good for beginners. can be used to hide the plastic pot, if you think it spoils the look. Using this method I am then able to place a changing array of plants in the one planter.That way if I think a plant looks lovely were it is I can leave it in place. But if I purchase a new plant or become bored with the plant currently in that planter I can replace it with another. This is also a good practice if the plant needs some outdoor air, you can take it outside for a breather and replace it with another. Or you may find that as the seasons progress that your plant is receiving to little or to much light, so you can replace it with one more suited to the light conditions. of the water damaging the furniture. Or if your planter is a heavy one it saves you lugging it out and back when its watering time. holes between your potted plant and its planter that can catch any excess water. switch out the planters as the plants.You can keep your favourite plants and just change their planters to get a different look.Or if your plant has grown and doesn't fit the planter anymore, you get an opportunity to try something different. Or start a collection of similar planters by colour or style, like brass, pottery, ceramic or white, marble or black, modern geometric or cool trending vintage.Perhaps start with the colours you like to use in your decor or ones that will compliment the type of plants you choose. And of course a variety of sizes and textures adds interest.Just like plants, the planter comes in a head spinning variety, you can collect to your hearts content. Besides vessels designed for plants, look outside the box and get creative. I like to use a lot of vintage in my home, but it can be difficult or expensive to source vintage planters. So I like to use cups and jugs, vases, compotes, baskets and even sugar bowls or anything else that takes my fancy, adds a touch of whimsy or matches the look or colour I'm after. Indoor plants and their containers, vintage or contemporary, can add so much to your decor. Plants are an easy decorating accessory to play around with. As mentioned you can rearrange them at anytime, by moving them around to different areas in your room or home. You can change the pot/planter or even replace the plants themselves, to get a whole new look, seasonally, or just randomly, when the mood takes you. Different times of the year bring different opportunities for flowering or scented plants. Celebrations such as Birthdays, Easter or Christmas are perfect times for these. Decorating with indoor plants can be done in such a variety of ways, there are plants and display styles to suit every individual and their space. From elegant to colourful and quirky, from earthy and environmental to the latest mod style, boho chic to jungle Jane. "free range - organic". But you can judge for your self, as all the photographs in this post are from my own home. Plant styling, or plant decor is just like the rest of your home decor, the choices are endless and all yours.You might even come up with a style of your own! As the trend to extend our living spaces outdoors has increased, designers and decorators have seen the great benefits of incorporating plants into interior decor to bring the outdoors in.This is not only because the plants bring a sense of being outdoors, its because indoor plants enhance the beauty of any home by improving the atmosphere or ambience of a space just by their presence. And just as plants are used outside in landscaping, some of the same principles such as proportion, aspect, and unity can be used with indoor plants for your housescaping! Plants can be used to screen something unattractive, or as a lovely green room divider. Use them to frame an entrance, or an art work. And a lovely large house plant can make a wonderful focal point in a room. Do you have noisy children, family or pets? Believe it or not plants can even help you with noise reduction in your home, by absorbing sounds, especially the high pitched frequencies. And don't forget all the other personal benefits of bringing the outdoors in that we discussed earlier, such as improved air quality and mood. So if you haven't started creating an interior garden of your own as yet, my advise is "Get to it"
And enjoy some wonderful leafy goodness in your living space. Start with just one plant, and see how it makes you feel. I think you will be pleasantly surprised, as well as healthier and happier! Don't forget to have a look at Plant Life Balance for information on the science regarding the benefits indoor plants bring to our living spaces and the best plant choices for different needs. I will be posting some tips on caring for your indoor plants soon, so watch out for that one. If you already enjoy the benefits of an indoor garden, please share any tips with us, I'm sure we would all love to here from you. Just had to share some Japanese cuteness with you, or Kawaii.We were given these very sweet gifts by our Daughter T, on her return from a recent trip to Japan. First up are these Japanese Kawaii match boxes. I just love the cute little chick and dog face on each match. Then we have Tokyo Banana! with a custard type banana flavoured filling. Gudetama is a little unusual because he is an egg! A very lazy egg. Not only is he on you tube and just about every product you can think of but Gudetama has his own Twitter and Facebook accounts with very large followings! 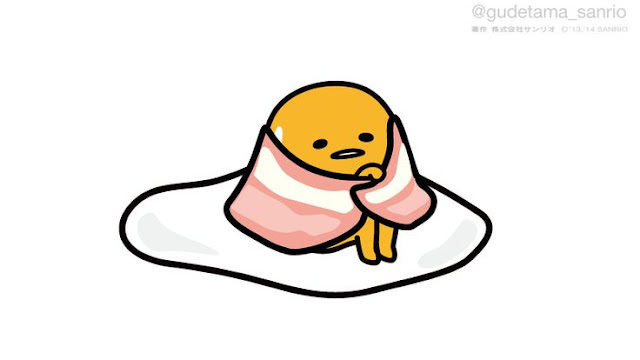 Gudetama is definitely cute, but he is also extremely lazy and depressed, often hiding from the world in his shell or wrapping himself in his bacon security blanket. Some articles have reported the character is based on the way parents see their millennial children! Whatever ideas are behind his creation, I think he is a little weird, sweet and funny. He is a big sensation in Japan, and his popularity is spreading across the world. When I looked at a few gifs and clips staring Gudetama, I could see why. I find Japanese culture really interesting for many reasons, The history, fashion and elegant serene gardens but one of the biggest has to be their wonderful products. Whether food, utensils, decor or art, so much effort has gone into making them cute, beautiful or evocative. Their products are never just something you eat or use. They often bring a smile to my face or twang my heart strings. And that is something I can always have more of. I think I might go and watch... just a few more.... Gudetama clips!